Gruppo Campari has introduced Wild Turkey Spiced and brought packaging back to the distillery with a new US$43m facility. The introduction of Wild Turkey Spiced is a move designed to offer a “more masculine choice to spiced rum". At 86 proof, Wild Turkey Spiced is a maintains Wild Turkey Bourbon’s signature flavour while highlighting spiced cues previously found only in island spirits. Wild Turkey associate master distiller Eddie Russell says he has created “an eminently mixable, yet sip-able spirit with a sweet and spicy taste profile that can be enjoyed on its own, but really shines when mixed with cola”. “I wanted to develop a liquid that brought to life the best of our robust Bourbon, while borrowing cues that have made island spirits so appealing,” says Eddie. “As the category continues to grow, many people, especially rum drinkers, are becoming curious about Bourbon and its sophisticated, more pronounced taste profile. We believe Wild Turkey Spiced is the perfect drink to bring them into the category.” Supported by a unique, tongue-in-cheek digital campaign that conveys what life is like on the “Island of Kentucky”, the marketing will take aim at the notion of graduating from Spiced Rum to the classic, all-American spirit – Bourbon. Boasting taglines like “Bourbon with a nautical twist – whatever nautical means” and “We considered putting a pirate on the label, until we realized pirates wear tights,” the “Island of Kentucky” embodies a macho mindset that transports nascent Bourbon drinkers to a fictional landscape where they can turn in their boring Spiced Rum credentials for something that invokes chest thumping, fist bumping and tremendous feats of strength – Wild Turkey Spiced. The campaign was developed by Wild Turkey creative agency of record VITRO of San Diego. The release of Wild Turkey Spiced continues a nearly 40-year tradition of innovation dating back to 1976 when Wild Turkey took the category in a completely different direction with the original honey flavoured Bourbon, better known today as American Honey. Wild Turkey Spiced has an RRP of US$22.99 per 750 ml bottle. This wek (on September 10, 2013) Gruppo Campari officially opened its new packaging facility at the Wild Turkey Distillery in Lawrenceburg, Kentucky. Commonwealth of Kentucky Governor Steve Beshear and Gruppo Campari CEO Bob Kunze-Concewitz joined Wild Turkey master distiller Jimmy Russell to commemorate the opening of the new facility with help from local dignitaries and distillery employees. The Packaging Facility is part of a US$100 million overall investment that the company has made in facility upgrades during a three year time span. While creating more than sixty new jobs in the area, the facility provides full bottling and packaging capabilities for all of Gruppo Campari’s US-distilled spirits brands, including the Wild Turkey Bourbon line and the company’s largest US-based brand – SKYY Vodka. Both immediate and long-term benefits of the new facility include cost efficiencies; improved customer service; more efficient and accelerated innovation opportunities; and added production flexibility through in-sourcing the company’s packaging needs. With more than 145,000 square-feet of space, the Wild Turkey Packaging Facility will initially handle up to four million nine-liter cases of product annually, but has the design capability and capacity to support Gruppo Campari’s North American packaging platform well into the future. The new facility immediately addresses the growth of Wild Turkey, Wild Turkey American Honey, Wild Turkey Spiced, Wild Turkey Kentucky Spirit, Russell’s Reserve, Rare Breed Bourbon, and SKYY Vodka domestically and around the globe. Since purchasing the brand in 2009, Gruppo Campari has made significant financial commitments to the distillery’s operations and its employees that have surpassed more than US$100 million. In 2011, the Company unveiled a US$50 million expansion at the distillery, more than doubling the plant’s production capabilities. This was coupled with the opening of multiple new barrel warehouses over the past several years. In 2014, Wild Turkey will open a new state-of-the-art Visitor Center. The popularity of Kentucky’s native spirit has exploded worldwide, with demand for Wild Turkey at its highest level in history. The Wild Turkey brand currently sells more than one million nine-liter cases worldwide (IMPACT Databank), with strong growth in the U.S., Australia, Canada, and Japan. Wild Turkey is the sixth largest global Bourbon brand (excluding sales of American Honey). Wild Turkey and SKYY Vodka are both distributed and marketed through Campari America in the US, Canada and Puerto Rico. 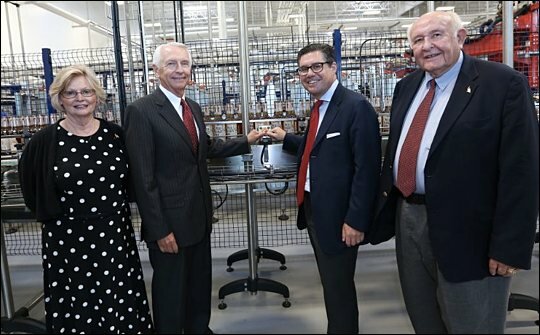 Pictured: Commonwealth of Kentucky Governor Steve Beshear and Lawrenceburg Mayor Edwinna Baker join Wild Turkey Master Distiller Jimmy Russell and Gruppo Campari CEO Bob Kunze-Concewitz to start the bottling line at Wild Turkey Bourbon’s new US$43 million packaging facility.